Built to handle big driveways and deep snowfalls, the Snow Joe Ultra SJ620 can move 650 pounds of snow per minute. It cuts a swath 18 inches wide and 10 inches deep, and a scraper blade efficiently clears snow right to the pavement-all without significant strain on your body. And because this snow thrower is powered by electricity instead of gas, it is incredibly easy to start and maintain. With winter fast upon us, it's important to be totally prepared. If you're in the market for a new snow blower or yours is on it's last limb, it's time to get a new one. When searching for this item, it's important to find one that is powerful enough to clear long driveways of snow without having to be out in the bitter cold for hours. If you're going to get a machine to do the job, it sure better be able to do it efficiently and quickly in my mind! At Consumers Survey, we found only the best and most efficient snow blower on the market. Responding to the need for an easy-to-use machine that could tackle heavier snowfall on mid-sized driveways and walkways, Snow Joe® developed the Snow Joe® Ultra SJ620, a larger electric snow thrower that delivers the power of a gas machine with the convenience of an electric unit. Driven by a powerful 13.5-amp motor, the Snow Joe® Ultra moves up to 650 lbs of snow per minute. Its durable, 4-blade rotor, constructed of heavy-grade steel, cuts 18 inches wide by 10 inches deep with each pass, clearing up to 2450 square feet per hour! In addition to its hard-working plowing capacity, the Snow Joe® Ultra features an adjustable discharge chute that rotates a complete 180º to provide full control over the snow stream direction. The chute deflector can also be adjusted to control the height of the snow stream. Easy-glide pivot wheels make the Snow Joe® Ultra easy to turn and maneuver on each pass. The scraper blade at the base of the unit efficiently scrapes the snow clear to the ground without damaging your deck or pavement. 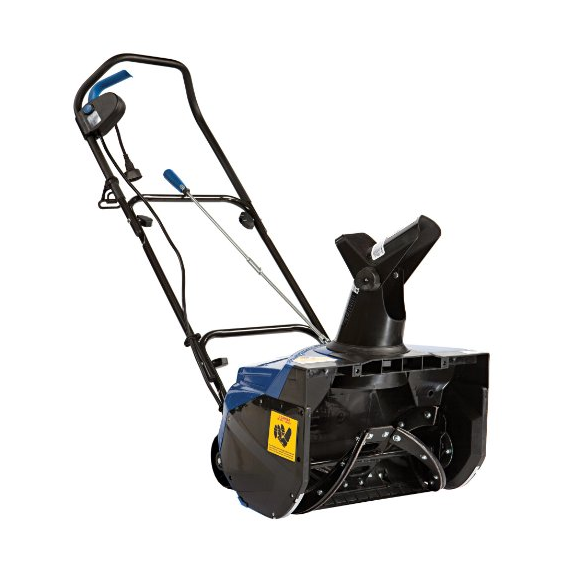 Powered electrically, the Snow Joe® Ultra SJ620 is effortless to start and maintain. No gas, oil, or tune-ups are necessary. The unit is ETL-approved and carries a full two year warranty. For heavier snowfall on mid-sized driveways and walkways, the Snow Joe®Ultra SJ620 is your smart solution this winter. If you're not a fan of yard work, you want anything that makes the job simpler and faster. This snow blower definitely fits the bill, with its powerful motor that helps throw snow up to twenty feet. Considering how large most driveway are, this really helps a great deal and makes clearing the driveway up after a storm so much faster. With its chute deflector, you can easily control the height of the stream of snow coming out as well, another fantastic and convenient feature to this machine.Get right down to the pavement, making sure that you clear the driveway completely and make it safe for your family, plus it is so easy to handle and maneuver.